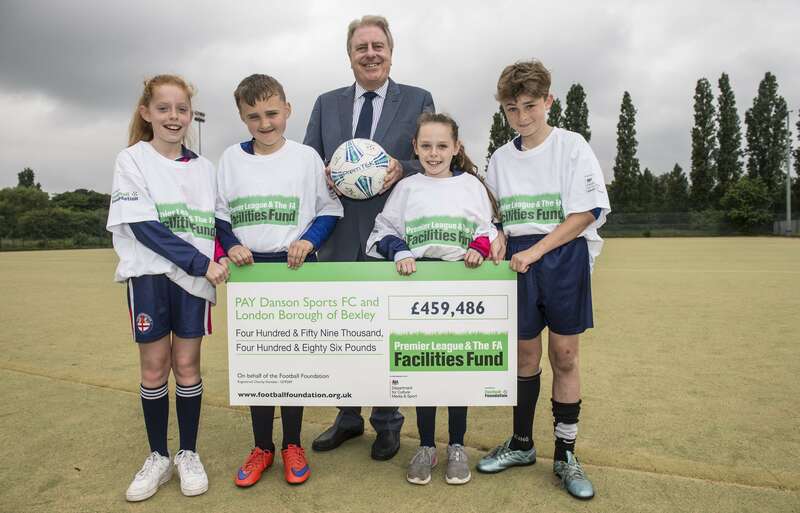 The players of Danson Sports FC in Crayford are looking forward to a brand new 3G pitch thanks to a £459,486 cheque from the Premier League & The FA Facilities Fund. The club - whose website is powered by Club Website - were awarded the funding along with the London borough of Bexley to boost sports participation in the local area. The funding was delivered by the Football Foundation - the country's largest sports charity - and will allow for the replacement of the current sand-dressed artificial pitch (pictured below) with a new floodlit 3G pitch and spectator viewing area, helping to address a shortage of floodlit sites in the area and provide a much-needed facility for other local teams. Supported by the borough of Bexley, Danson Sports have worked with the Football Foundation and London FA to create a five-year Football Development Plan (FDP) outlining how sport will be played on site with an emphasis on an increase in participation. As part of the plan, Danson will increase their teams from 36 to 54, providing football for men and women across all age ranges. The club plans to increase the number of female teams to nine, including a women’s open age team, whilst doubling their male senior, under-21s and under-18s teams. Discussions have also begun with the South London Special League about hosting their matches. Club chairman Steve Wicks said: “Danson Sports is committed to providing affordable access to quality facilities, and an upgrade to 3G enables us to extend this beyond our own membership to other grassroots clubs and community organisations in the local area. Since it was launched in 2000, the Football Foundation has supported more than 14,000 grassroots projects worth over £1.3 billion, supported by funding from the Premier League, the FA and the Government via Sport England. By providing more high-quality facilities, coupled with coaching at the appropriate age group, the Premier League & The FA Facilities Fund - the latest branding for the Foundation's investment - aims to improve the experience for regular players as well as attracting new players to the game. Since 2000, the Foundation has awarded grants worth £4.5m towards grassroots sports projects worth over £24m across the whole of the Bexley borough. The latest cheque to boost grassroots sport in the area was presented to Danson Sports FC by the Rt Hon David Evennett, MP for Bexley and Crayford and acting sports minister whilst Tracey Crouch MP is on maternity leave. “The opportunity this project can give to our community is invaluable," said Evennett. "Investment in grassroots football is crucial to help children to develop and grow – not just as footballers but as leaders and people. To find out more about the Football Foundation, visit footballfoundation.org.uk. This article appeared in The Clubhouse - the monthly newsletter from Club Website. To get the best grassroots news, offers and competitions straight to your inbox every month, sign up today!